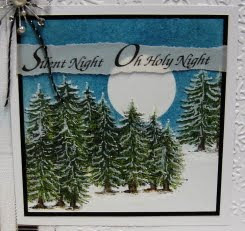 Well I’m in the “Tree Mood”, hope you can stand another Tree Card.This was done using a small “Old” Hero Arts stamp and just repeating the image over and over. Again masking the moon and coloring the trees and adding white gel pen. 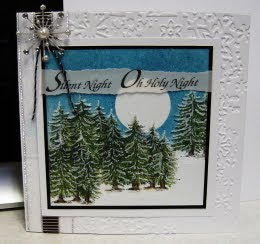 New embossing folder from Sizzix was embossed on edge of the 5 x 5 card. Inside panel is 4 X 4. GORGEOUS trees and I don't think I could ever tire of your exquisite art! You leave out no detials and even your snowflake embellishment is stunning! Love this! Stand it? are you kidding There GORGEOUS!!!! !